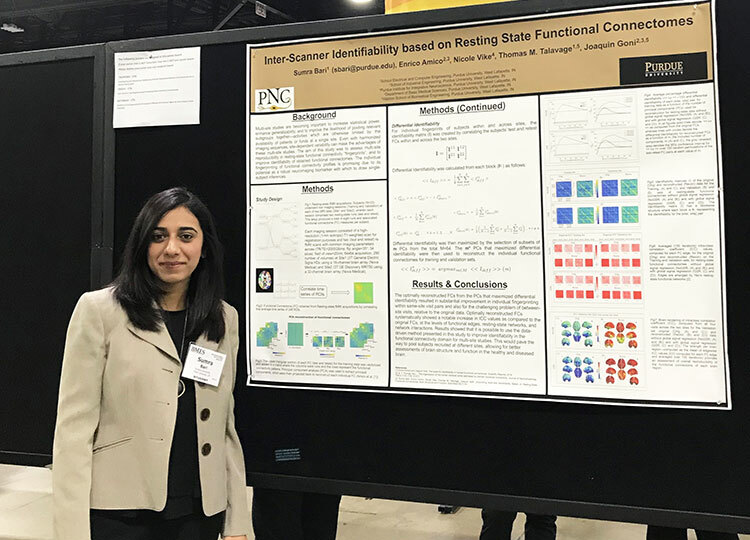 Bari, a PhD Candidate in the Purdue University School of Electrical and Computer Engineering, presented a poster titled "Inter-Scanner Identifiability based on Resting State Functional Connectomes". "The aim of the study was to assess multi-site reproducibility of brain fingerprints in resting-state functional connectomes, and to improve identifiability of obtained functional connectomes," said Bari. "The individual fingerprints in test-retest visit pairs within and across two sites were evaluated and a generalized framework based on principal component analysis was presented to improve identifiability. The results indicated a substantial improvement in reliability in individual fingerprinting of the subjects within and across the two sites." The BMES Annual Meeting is one of the largest conferences in biomedical engineering, offering networking sessions, career opportunities, and over 2000 scientific presentations. The meeting brings researchers together from different areas and backgrounds to improve networking and to learn about innovations in the field. It took place Oct. 17-20 in Atlanta, GA.